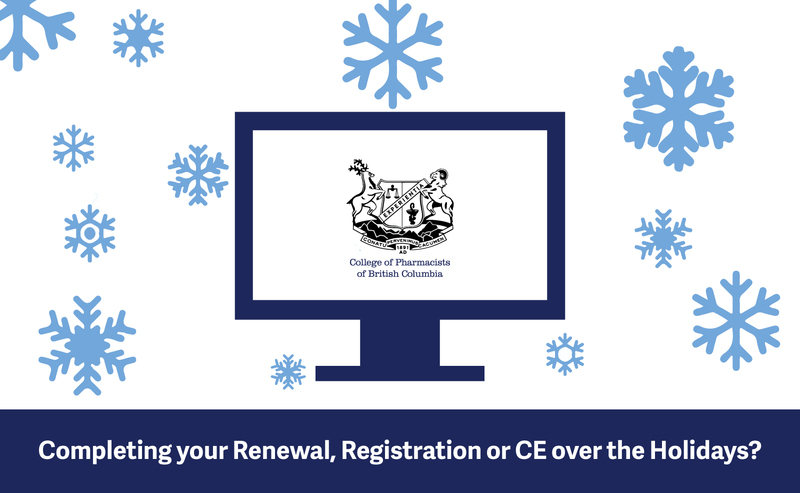 COMPLETING YOUR RENEWAL, REGISTRATION OR CE OVER THE HOLIDAYS? If you are planning to submit your continuing education, or complete your registration or pharmacy license renewal over the holidays, make sure you are prepared. The College Office will be closed from December 25, 2018 to January 1, 2019. This means College staff will not be available to help answer questions or provide technical support during this time. The College Office will re-open on January 2, 2019. Any issues or questions that arise during the closure can be addressed at this time. Renew your registration or licence, complete your practice review action items, or submit your Continuing Education information early so staff can support you if needed. Review the requirements and steps involved in completing your registration renewal or pharmacy licence renewal and ensure you have all the information required. See the FAQs for Registration and Licensure to answer questions you may have. Review the requirements of the Professional Development and Assessment Program and how to submit your Continuing Education through the CE-Plus tool. There’s a handy tutorial, quick help sheet, in addition to FAQs and learning record examples. Review the Practice Review Program information including the PRP support tools and resources to help prepare for a practice review or complete actions items.